Since the early 1900s, ozone has been widely used for water treatment, including disinfection of municipal water supplies, swimming pools, spas, cooling towers, and sewage treatment plants. Recently, ozone has been used in food processing for sanitizing raw materials and irrigation waters, sanitizing packaging materials and storage facilities, and for sanitizing water for recycling. Prior to 1997, ozone could only be used for sanitation and purification of bottled drinking water in the U.S., and it is widely used around the world for this purpose today. In May 1997, an expert panel assembled by the Electric Power Research Institute (EPRI) declared ozone to be Generally Recognized as Safe (GRAS) for use in food processing in the U.S. Since then, wineries have embraced the use of ozone. Its use has been generally accepted and documented to be effective for barrel cleaning and sanitation, tank cleaning and sanitation, clean-in-place systems, and for general surface sanitation. This same trend of acceptance has been noted in many other industries, such as fresh-cut produce processing; produce storage facilities; food processing, including meat processing facilities; and, as noted above, in the bottled water and beverage industries. In these industries, the ozone systems are generally permanently mounted or fixed in place, which makes management of off-gas and ozone monitoring for safety and efficacy relatively easy. However, in the wine industry, ozone systems tend to be mobile, with multiple operators in multiple locations. This makes it important that safety features and ozone management systems be in place and that the system itself be reliable and easy to operate. Ozone, or O3, is generated in nature as a bluish or colorless gas characterized by the clean fresh smell in the air following a thunderstorm. When oxygen (O2) and electricity interact, ozone is created, and this is why we smell ozone around copy machines, electric motors, or during arc welding. Natural levels range from 0.01 ppm to 0.15 ppm and can reach higher concentrations in urban areas. Ozone is an unstable gas and readily reacts with organic substances. It sanitizes by interacting with microbial membranes and denaturating metabolic enzymes. Ozone will also attack microbial biofilms and degrade them much as it would any other polysaccharide. Upon release of its oxidizing potential, ozone reverts back to oxygen from which it was generated. Application of ozone does not leave a chemical residual, and under ambient conditions, it has a half-life of 10 to 20 minutes. Thus, ozone must be electrically generated on-demand and cannot be stored for later use. Ozone is generated by irradiation of an air stream with ultra-violet (UV) light at a wavelength of 185 nm or by passing dry air or oxygen through a corona discharge (CD technology) generator. For low ozone concentrations (ca. 0.14% by weight, or 0.5 grams per hour), the less expensive UV equipment is sufficient. For more demanding situations, where higher ozone concentrations (1.0% to 14% by weight) are required, CD systems are used. The wine industry is using both CD technology and UV. Some manufacturers use multiple UV tubes to achieve a desired level of output. Several manufacturers chose to install air-cooled or water-cooled CD generators in their systems. It is really a question of how much ozone at a certain gpm is desired for an application. For CIP, 20 gpm may be desired, necessitating a larger system, while only 10 gpm at a lower concentration may provide satisfactory barrel washing. Ozone is a toxic gas and must be monitored in the workplace when in use. However, in almost 100 years of industrial use, there has never been a human death attributed to overexposure to ozone. The Occupational Safety and Health Administration (OSHA) has set limits for ozone exposure in the workplace. These limits are for continuous eight-hour exposure of no more than 0.1 ppm, and a short-term exposure limit (STEL) of 15 minutes at 0.3 ppm, not to be exceeded more than twice per eight-hour work day. Consequently, ozone requires monitoring in the workplace if used for environmental or equipment sanitation. Ozone monitors are readily available, and the supplier of ozone generating equipment should be able to assist with the selection and use of such monitors. A manual containing all the relevant safety information for working with ozonating systems is essential; it should also contain operating instructions for the wineryÕs generating system. Workplace monitoring for ozone off-gas must be performed, and records must be maintained to assure OSHA compliance. When ozone is generated, it is important that the concentration and flow rates be verified, and these should be checked periodically by a technician on some regular schedule or interval (e.g., monthly). All ozone generated should be accounted for, by checking for leaks in the system and by proper destruction of any excess ozone. If the ozone is being applied as a gas for the fumigation of a storeroom or cellar, monitoring at the far end of the room and feedback control is desirable. If the ozone is dissolved in water and this water is subsequently used for sanitation, there is always some excess ozone that will not be dissolved into solution. No ozone mass transfer system is 100% efficient. Excess ozone, or entrained ozone gas, must be “de-gassed” or separated from the water stream prior to delivery to equipment or the processing environment. This excess ozone must also be destroyed or decomposed back to oxygen before being released back into the atmosphere. Thermo-catalytic ozone destruct units are small, efficient, and available for this purpose. It is not enough to just purchase an ozone generator. Your winery must also have maintenance, verification of performance, monitoring, and, especially in the case of mobile ozone units, an in-place systems approach that ensures the safe use of ozone in the workplace. Properly used, these ozone sanitizing systems are much safer than chemical (chlorine and caustics) or heat-based sanitizing systems. One concern is that use of ozone will oxidize equipment and facilities, and this can happen if the materials are incompatible with ozone. Most materials used in food processing are compatible. Stainless steel (e.g., 316L) is corroded less by ozone than by chlorine, and common plastics used in food processing are generally resistant, including ECTFE (Halar®), PTFE (Teflon®), PVDF (Kynar®), PVC (rigid, schedule 80 or 40), and silicon tubing and gaskets. Natural rubber will readily degrade; however FPM (Viton®) and Teflon gaskets are very stable. When ozone is used in high concentrations, stainless steel, Teflon, and Kynar are the best construction materials. PVC should be avoided under high concentration conditions. In general however, high concentrations (in the low percent range) are only found inside the generator or in the ozone-to-water contacting system. Aside from natural rubber material, brass and copper should also be avoided for concentrations over 1.0 ppm of ozone dissolved in water. Recently, in my laboratory at California Polytechnic State University, a study was performed to evaluate ozone’s effectiveness as an environmental sanitizer. The fruit and vegetable pilot plant in the university’s Food Science and Nutrition Department became the location for the test, and the ozone system used in the study was a DEL Industries model AGW-0500 Surface Sanitizer™. This system is able to deliver an applied dose of 2.0 ppm through a 10 gpm hand-held spray wand, typically delivering a residual (measurable) dose of around 1.5 ppm ozone-in-water solution. Environmental ozone monitoring was performed using an EcoSensor ambient monitor, and concentrations in solution were verified using a Rosemount Analytical dissolved ozone monitor (model 1054B). Various surfaces in the facility were sprayed with the ozonated water in a back and forth fashion for one minute. The test surfaces included a polished stainless steel mixing kettle and table top, stainless steel shroud, central floor drain, a plastic shipping container, and two locations on the non-slip epoxy-coated concrete floor of the facility (area 1 is high-traffic and area 2 is low-traffic). Test areas were not cleaned prior to sanitation, so only the effect of the ozone spray wash was measured. Testing was repeated four times, and microbial load of a 100 cm2 area was measured before and after ozone application, using both aerobic plate count (3M APC Petrifilm) and bioluminescence (Biotrace; UniLite UXL 100 Bioluminometer). Results are presented in Table I. The results indicate that ozone applied as a spray wash is effective in reducing microbial load in the processing environment. The drain presented problems during the test because the ozonated water applied to the drain washed throughout the long central drain ditch, which made results inconclusive. 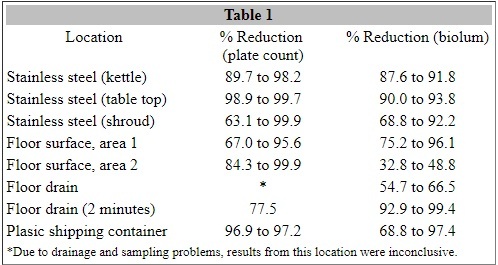 A second test on the drain for two minutes of exposure did provide a reduction in microbial load (see Table I). One advantage ozone has is its ability to readily oxidize microbes in solution. Thus, once a surface is spray-washed, the microorganisms physically lifted from the surface will be killed as they find their way to a drain. The data above represents one series of tests over a two-week period (evaluations performed approximately every third day). With continued or daily use, it is reasonable to expect that the microbial load will be significantly eliminated at all locations exposed to the ozone. Because ozone requires no storage or special handling or mixing considerations, it may be viewed as advantageous over other chemical sanitizers. Some may consider the fact that ozone leaves no sanitizing residual a disadvantage, but if a residual is desired, there are many other sanitizers available to accomplish that. Ozone can be considered a complimentary sanitizing regime to help maintain the overall cleanliness and sanitation of a winery. Dr. Brian C. Hampson, is a professor of Food Science at California Polytechnic State University, San Luis Obispo, CA.